"I'm not about death, I didn't want to die, but I wanted to come close." Magnolia has debuted an official trailer for a documentary titled Burden, telling the story of artist Chris Burden, who made his place in art history in 1971 with dangerous performances. The film features Burden himself, as well as Jonathan Gold, Marina Abramovic, Frank Gehry, Alexis Smith, and Brian Sewell. The description says the doc examines "the artist’s works and private life with an innovative mix of still-potent videos of his 70s performances, personal videos and audio recordings, friends fellow students and colleagues, critics’ comments and latter day footage at his Topanga Canyon studio, all peppered with his thoughts and musings through the years." This definitely looks fascinating, and I'm intrigued to learn more about Burden and his motivations for this. Chris Burdern guaranteed his place in art history in 1971 with a period of often dangerous and at times stomach-churning performances. After having himself purposefully shot, locked up in a locker for five days, electrocuted, and crucified on the back of a VW bug, Burden reinvented himself as the creator of truly mesmerizing installations and sculptures, from a suspended gigantic flywheel that seemingly spins on its own, to an assemblage of antique streetlights rewired for solar energy and illuminated outside the Los Angeles County Museum of Art. 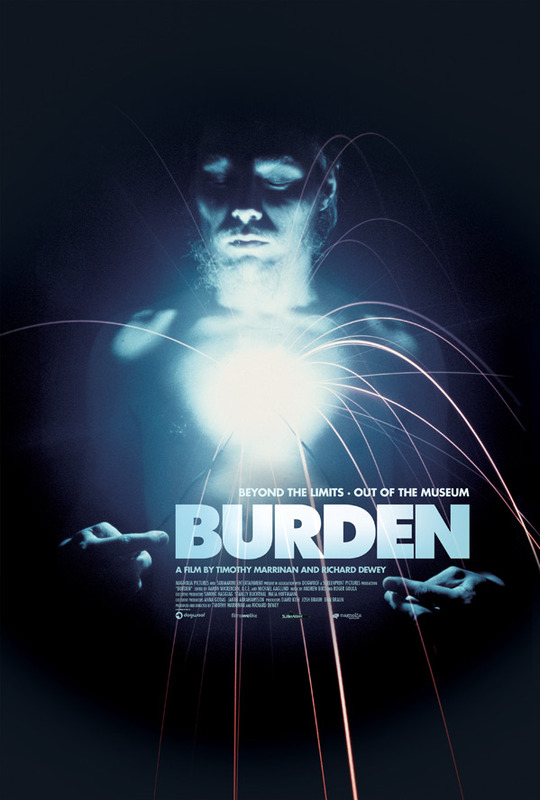 Burden is co-directed by filmmakers Richard Dewey and Tomothy Marrinan, of short films for Chris Burden previously. This first premiered at the Tribeca Film Festival in 2016. Magnolia will release Burden in select theaters + on VOD starting on May 5th this summer. Curious?